Image Source / Getty Images. The forest biome includes terrestrial habitats that are dominated by trees and other woody plants. Today, forests cover about one-third of the world's land surface and are found in many different terrestrial regions around the globe. There are three general types of forests—temperate forests, tropical forests, and boreal forests. Each of these forest types differs in climate, species composition, and community structure. The forests of the world have changed in composition over the course of evolution. The first forests evolved during the Silurian Period, about 400 million years ago. These ancient forests were very different than present-day forests and were dominated not by the species of trees we see today but instead by giant ferns, horsetails, and club mosses. As the evolution of land plants progressed, the species composition of forests changed. During the Triassic Period, gymnosperms (such as conifers, cycads, ginkgoes, and gnetales) dominated forests. By the Cretaceous Period, angiosperms (such as hardwood trees) had evolved. Although the flora, fauna, and structure of forests vary greatly, they often can be broken down into several structural layers. These include the forest floor, herb layer, shrub layer, understory, canopy, and emergents. The forest floor is the ground layer that is often covered with decaying plant material. The herb layer consists of herbaceous plants such as grasses, ferns, and wildflowers. The shrub layer is characterized by the presence of woody vegetation such as bushes and brambles. The understory consists of immature and small trees that are shorter than the main canopy layer. The canopy consists of the crowns of mature trees. The emergent layer includes the crowns of the tallest trees, which grow above the rest of the canopy. 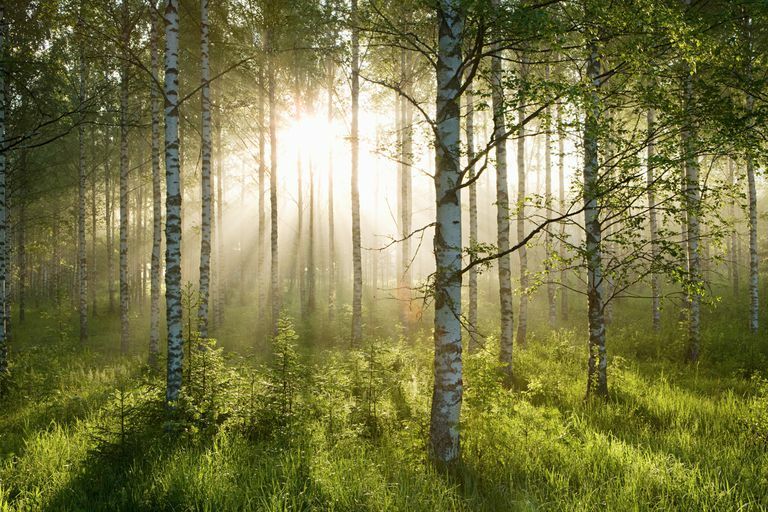 Temperate forests are forests that grow in temperate regions such as those found in eastern North America, western and central Europe, and northeastern Asia. Temperate forests have a moderate climate and a growing season that lasts between 140 and 200 days of the year. Precipitation is generally distributed evenly throughout the year. Tropical forests are forests that grow in tropical and subtropical regions. These include tropical moist forests (such as those found in the Amazon Basin and the Congo Basin) and tropical dry forests (such as those found in southern Mexico, the lowlands of Bolivia, and the western regions of Madagascar). Boreal forests are a band of coniferous forests that encircle the globe in the high northern latitudes between about 50°N and 70°N. Boreal forests form a circumpolar ecoregion that stretches across Canada and extends across northern Europe and Asia. Boreal forests are the world's largest terrestrial biome and account for more than one-quarter of all the forested land on Earth. Pine Marten (Martes martes) - The pine marten is a medium-sized mustelid that inhabits the temperate forests of Europe. Pine martens have sharp claws are good climbers. They feed on small mammals, birds, carrion, as well as some plant materials such as berries and nuts. Pine martens are most active at dusk and during the night. Gray Wolf (Canis lupus) - The gray wolf is a large canid whose range includes the temperate and boreal forests of North America, Europe, Asia and North Africa. Gray wolves are territorial carnivores that form packs of a mated pair and their offspring. Caribou (Rangifer tarandus) - The caribou is a member of the deer family that inhabits the boreal forests and tundra of North America, Siberia, and Europe. Caribou are grazing herbivores that feed on the leaves of willows and birches, as well as mushrooms, grasses, sedges, and lichen. Brown Bear (Ursus arctos) - Brown bears live in a variety of habitats including boreal forests, alpine forests and meadows, tundra, and coastal regions. Their range is the most extensive of all bears and includes northern and central Europe, Asia, Alaska, Canada, and the western United States. Eastern Gorilla (Gorilla beringei) - The eastern gorilla is a species of gorilla that inhabits the lowland tropical forests of the eastern Democratic Republic of Congo in central Africa. Like all gorillas, the eastern lowland gorilla feeds on fruit and other plant materials. Black-tailed deer (Odocoileus hemionus) - The black-tailed deer inhabits the temperate rainforests that blanket the coastal areas of the Pacific Northwest. 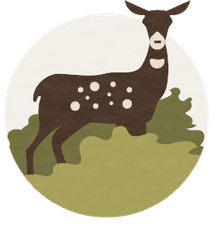 Black-tailed deer prefer the edges of forests where understory growth is sufficient to provide them reliable food resources.